This episode of RunAs is brought to you by SQL Intersection. Eight full-day workshops and over 40 technology-focused sessions make SQL Intersection a unique source of the best information around SQL Server from real-world consultants and members of the SQL Server team. You'll learn proven problem-solving techniques and technologies you can implement immediately as well as learn about the future of SQL Server. Get answers to performance monitoring, troubleshooting, designing for scale and performance, cloud, as well as new features the latest version of SQL Server 2016. It's time to determine your migration strategy and SQL Intersection is the place to figure out the best way to do it. 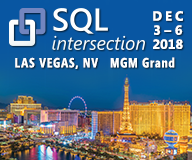 Come to SQL Intersection at the MGM Grand Hotel in Las Vegas, December 3-6. Use code RUNAS to get a discount on your registration at sqlintersection.com! See you there! Data Warehousing is for everyone! While at Build in Seattle, Richard sat down with Matt Usher to talk about the latest version of Azure SQL Data Warehouse. Matt talks about how the cloud has made the barrier of entry for data warehousing trivially low - costs that are dollars per hour, so that you can afford to experiment at almost any scale. What can data warehousing do for you? Make your company more competitive and efficient! Matt is a seasoned technologist having started as a consultant with Deloitte, ventured through several startups, and then landing at Microsoft in 2003. Matt currently works as a program manager in the SQL Server division working on the Azure SQL Data Warehouse service and Appliance Platform System (APS) appliance.